The UIA (USB Isolation Adapter) is a USB 2.0 (Full Speed, Low Speed) compliant device that provides complete isolation of a down stream USB device from the up stream host computer. Ground loops are eliminated. Host computer or device generated common mode noise and RF induced noise is significantly reduced or eliminated. It also provides 5000Vrms isolation between the host computer and the down stream device. Also 8KV of ESD protection is provided. The UIA provides these benefits using a number technologies. 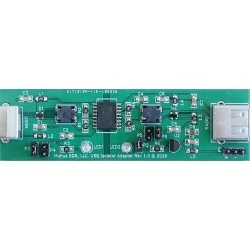 1) An Analog Devices ADuM4160™ USB Digital Isolator provides USB isolation. 2) RF chokes are implemented on all voltage supply lines. 3) Separate ground planes have been implemented for both the up stream and down stream. 4) Power for the up stream and down stream devices are completely separated and independent. 5) 8KV ESD protection devices are attached to the USB data lines. The UIA works with any 2.0 USB Full Speed or Low Speed device. It is the solution for USB connections that suffer with ground loop or noise problems. The UIA is sold as a kit and contains SMT devices. Please do not use this website to obtain technical support. Requests for technical support via this website will not receive a response. NOTE: These kits are produced at time of order. There is a two day lead time before shipping the kit. 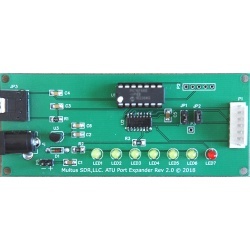 he ATU Port Expander is a device that attaches to a Multus Basic or Proficio transceiver’s ATU port, interprets band data sent to it and selects a corresponding output port for the activation of relays (or other devices) such as a low pass filter relay(s). It also provides a separate output port for the activation of a two port remote antenna switch such as the MFJ-4712 (via a bias tee). Each output port is capable of sinking 350ma and has a maximum input voltage of 50V. The ATU Port Expander is well suited for driving inductive loads (relays). *Compatible with ATU port of the Basic and Proficio transceivers. *Six output ports (50V maximum voltage, 350ma per port). *Port selection configuration via selection jumpers. 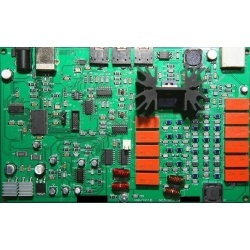 The ATU Port Expander is sold as a kit and contains SMT devices. A bare bones option is available that provides the PCB, programmed microprocessor and socket. A bill of material is available on our support forum. The SMSG (S Meter Signal Generator) is device that generates a selectable S9 or S4 signal in one of 4 selectable bands. The SMSG is useful for calibrating the S Meter of any receiver or transceiver. It is particularly useful for calibrating the S Meter of a SDR application such as HDSDR or GSDR and others. The SMSG is sold as a kit and contains SMD devices. It is easy to build and will take about 2 hours for an experienced builder. The MFC (Multi Function Controller) is an optional accessory for the Proficio Transceiver. It provides a more transitional way to operate the transceiver. The MFC is easy to build and install. 1) 16x2 Display. Displays frequency, switch function, operating mode, frequency step and transmit On/Off. 2) Multi function tuning knob. The knob may be configured to change frequency, volume or RIT offset. 3) Tuning knob push button switch. The tune knob has an internal switch that may be configure to control one of the various available functions. Frequency step,PTT On/Off ,TUNE On/Off,MODE Selection,RIT On/Off, Band Selection, Frequency/Volume control, CW Bandwidth, High Pass Filter Selection, RIT Tuning, Favorites Selection and No Function. The MFC is compatible with Proficio PCB versions 4.3 and REV C (with a minor wire change). The Proficio enclosure is required for the MFC. The MFC replaces the front panel with a front panel adapted for the MFC. The Proficio is the next generation of Transceivers. It is an all band version (160M - 10M) transceiver. •96kHz digital I/Q interface. No additional sound card needed. Only one USB connection is needed. •External Amplifier control via AMP port. •Firmware Field Updates via on board USB bootloader. • All band. The Proficio covers all bands from 160M to 10M. • The same BPFs are used in conjunction with Low Pass Filters in the transmit path to provide a clean output. • 5W Class A PA. Clean output of 5W on all bands (slightly less on 160M and 10M). • Real CW. Supports zero latency CW. Software generated CW is not required. Multus SDR, LLC. provides a custom in house produced host application - MSCC. MSCC is custom designed for the Proficio and is recommended when operating the Proficio. 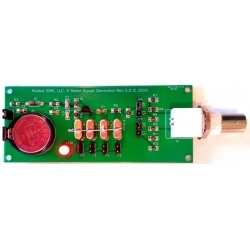 We believe our transceiver kit when used with our MSCC custom host application, is the easiest to use SDR transceiver kit available in amateur radio market. The build time is approximately one hour. Installing and using our transceiver on your PC is plug and play. There are no cumbersome and confusing configurations to deal with. If building a kit is not your thing, we offer a build service at a nominal cost. The build service provides a professionally built and fully tested transceiver. The Proficio is also compatible with all host SDR applications that work with the Basic (HDSDR, Genesis SDR, Quisk and others). 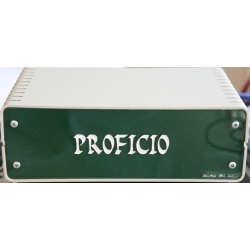 The Proficio is supplied as a kit with all SMD devices installed. The customer needs to install the thru hole components. Spurious Emissions: Meets or exceeds FCC requirements (-43db from carrier). These kits are produced at time of order. There is a two day lead time before shipping the kit. The Proficio enclosure features a rugged ventilated case with a cooling fan and easy to assemble. The rear panel is ready to accept the optional MFC (Multi Function Controller). NOTE: There is a two week lead time in shipping the enclosure.